In one episode of the Gallic Wars, Julius Caesar, then Proconsul of Rome, crossed the Rhine River to support allied Germanic tribes. His written narrative explains the necessity, but considers boats beneath his army’s dignity. He designed a temporary bridge, quickly assembled and removed. The descriptive Latin text has received speculative translation, including an “oblique” drawing from book 3 of Palladio’s four architecture books from Venice, 1570. At the invitation of Chicago’s Julius Caesar Gallery Every house has a door in collaboration with sculptor Ilie Paun Capriel created a platform/object installation. Scaled to the small size of Julius Caesar Gallery, this work offered another generation of translation of Caesar’s bridge over the Rhine, and doubled as a stage for a context-specific 23-minute performance. 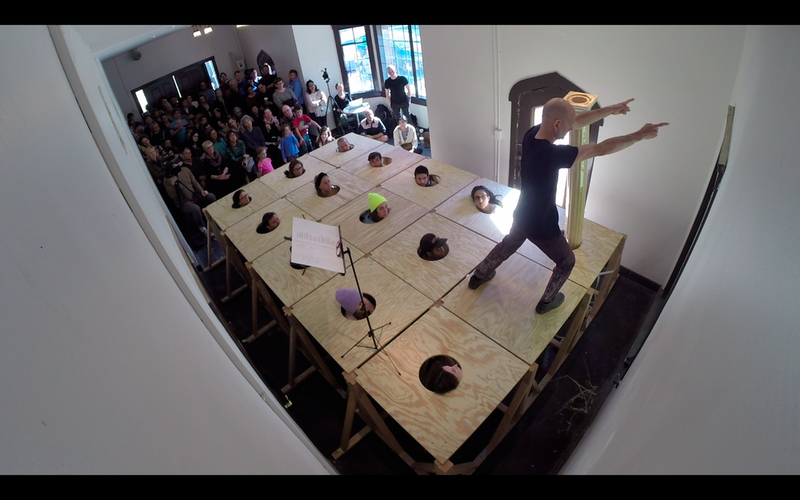 In October 2014, Comfort Station hosted the reconfigured version of the installation/performance Caesar's Bridge presented in 2013 at Julius Caesar Gallery. Occurring every Sunday in October Caesar's Bridge at Comfort Station was presented in affiliation with 6018 North and the Chicago Architecture Biennial.